This was a guest post that I did some time ago over at Simple Simon for the “Skirting the Issue” series. 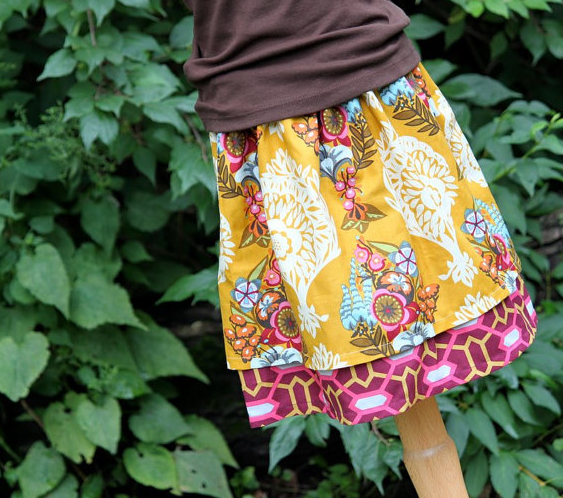 Consider using this tutorial and making these skirts out of corduroy for fall or use your favorite designer quilting cotton in fun prints for a more bold statement. No matter what fabric you choose, your own little lady or the little foster care girl you are sewing for will LOVE to twirl in these skirts. My name is Lindsay Wilkes from The Cottage Mama and I’m so excited to be here as part of the ‘Skirting the Issue’ series. 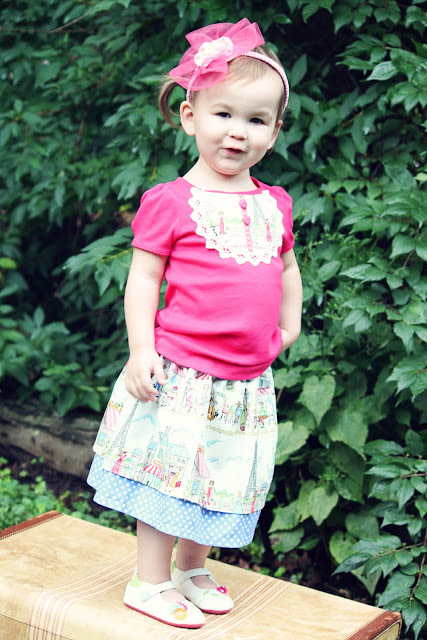 What an amazing cause and I’m thrilled to be able to provide some handmade skirts for some very special little ladies. I make clothing for my children all the time and the idea of a child never having something special made just for them, breaks my heart. Every little one deserves to feel special, pretty, girly and loved and it is the least I can do to provide some skirts to hopefully bring those feelings into some little girls hearts. 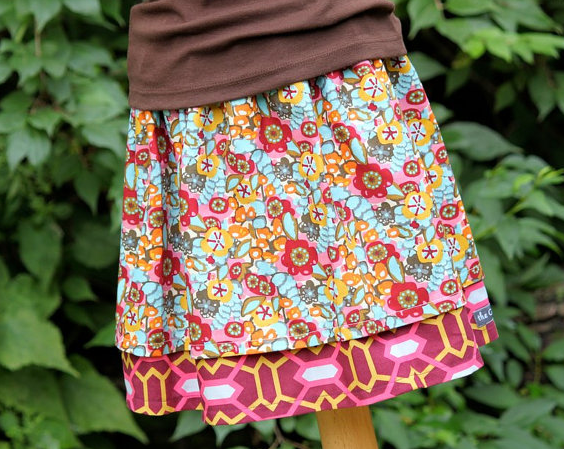 In thinking about what kind of skirt I wanted to make, I was considering several things. 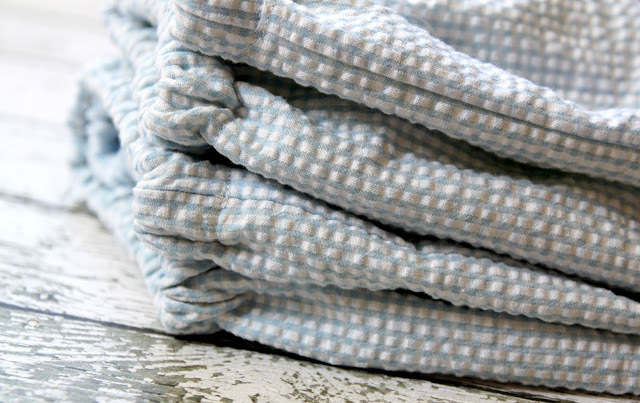 I definitely wanted these skirts to wash well……..meaning no need to press. I wanted them to be light and summery with a bit of twirl factor, so I decided on making some Seersucker Double Layer Twirl Skirts. Want to make some yourself? Here’s the how-to…….. 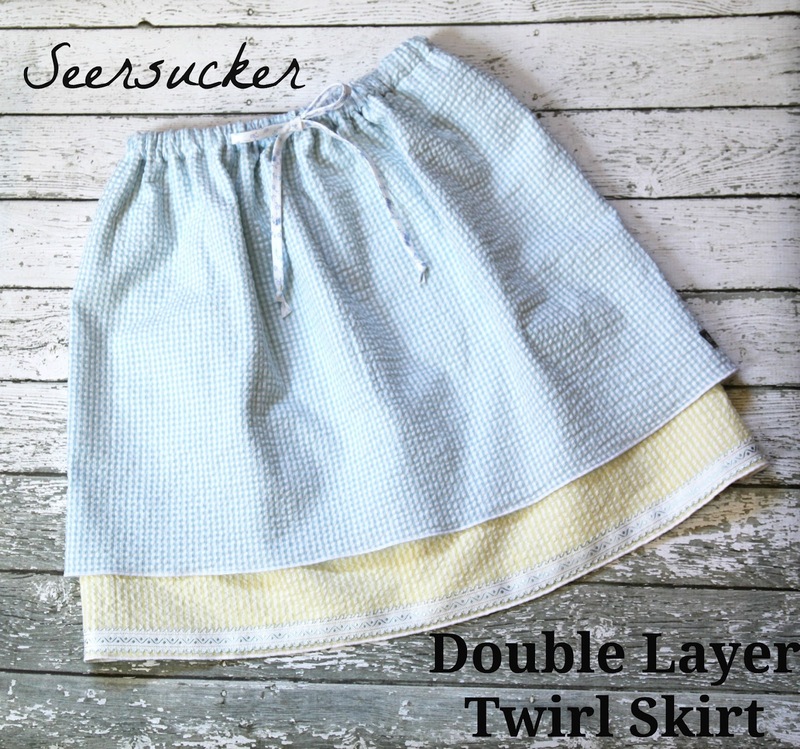 I am providing you with all the measurements you need in order to make a double layer twirl skirt. 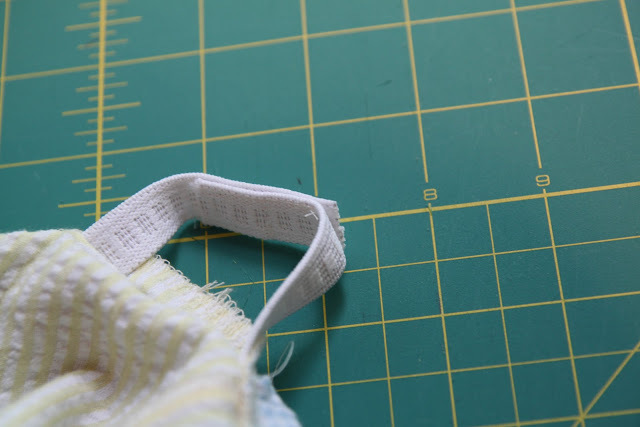 These measurements are assuming you are NOT using a serged hem, they are for a regular, traditional 1″ hem. 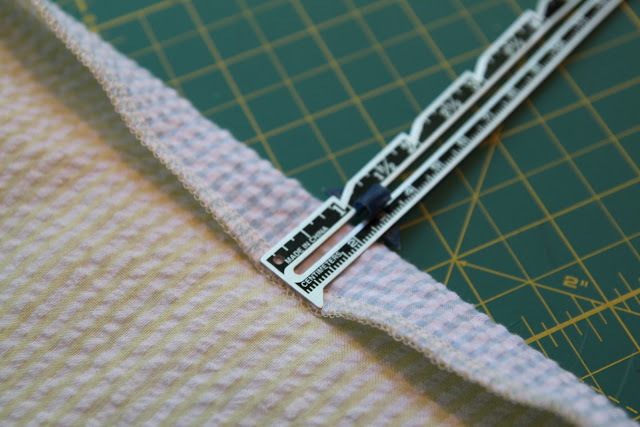 If you would like to do a rolled hem with your serger (as I did), then please subtract 1″ from the length of each measurement. Cut your two layers (following cutting dimensions above). Sew each of the layers together at the side seam (wrong sides together), meaning sew together on the short sides. This will form each skirt layer. 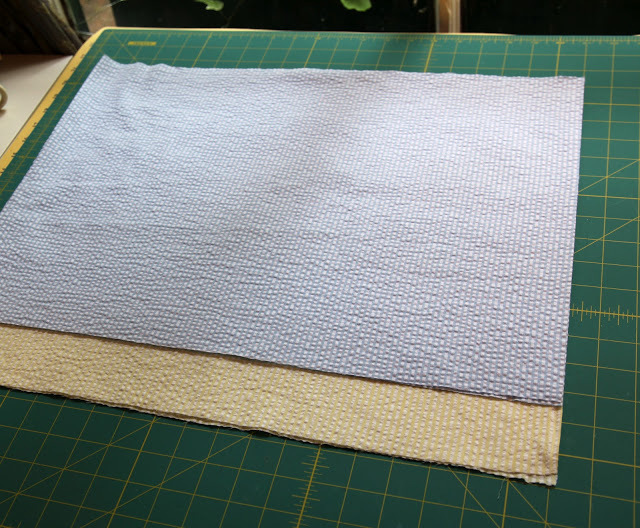 Hem the bottom of each layer by folding the bottom raw edge up towards the wrong side of the fabric a 1/2″ and then another 1/2″ and sew in place. 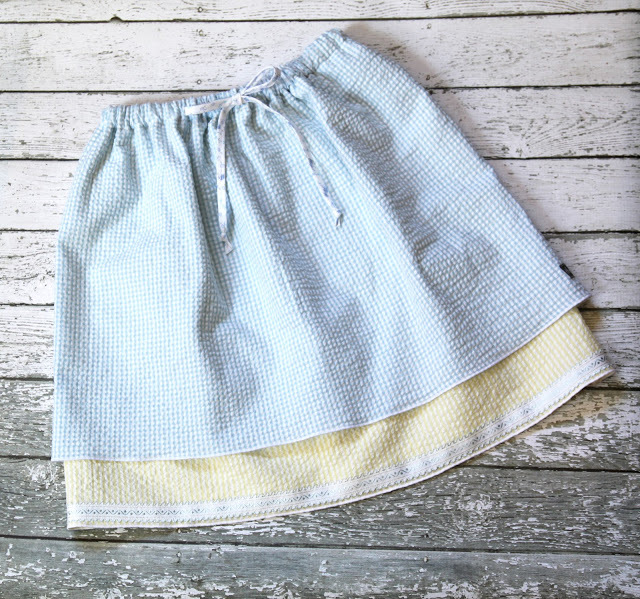 Place the longer skirt inside the shorter skirt and baste stitch or serge the top of the skirts together. You can skip this step but it makes then next step easier. 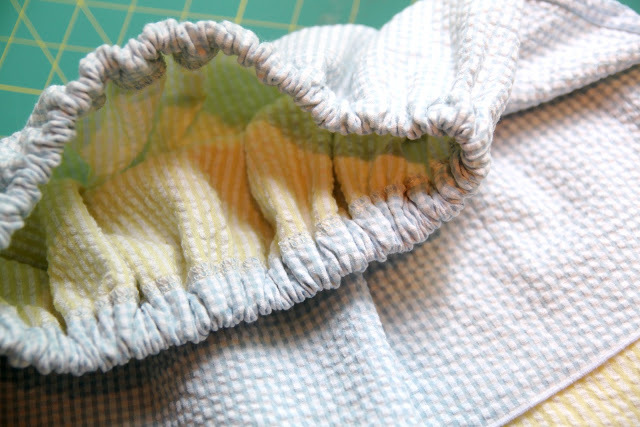 Fold over the top of the skirt 1″ towards the wrong side of the fabric. Sew in place, leaving a 2″ opening. Cut your elastic. 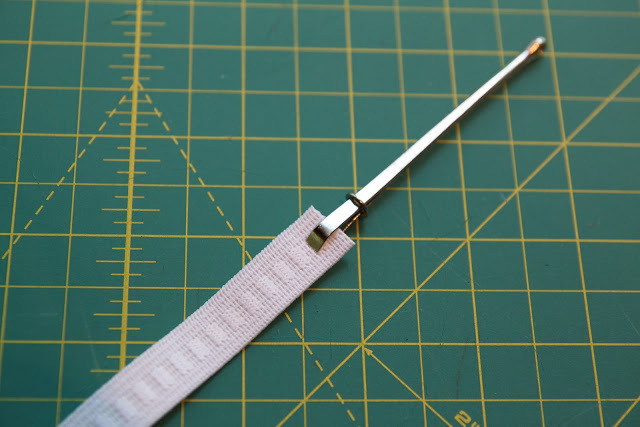 If you don’t have a bodkin, I highly recommend one…….they make threading elastic so much easier. But if you don’t have one, just attach a safety pin to the end and that will work just fine. 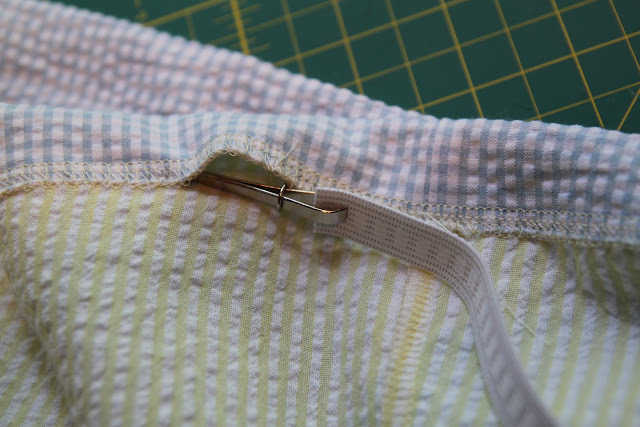 Thread the elastic through the top of the waistband. 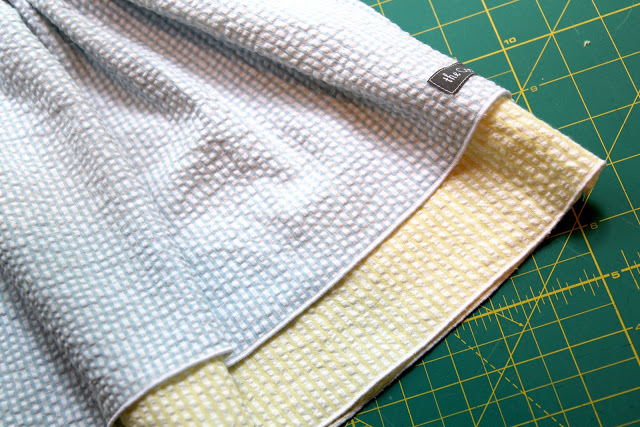 Overlap the elastic by 1″ and sew in place with a zig-zag stitch to secure. Close the opening in the top of the skirt. I chose to do a rolled hem using my serger because I like the way it looks on seersucker. I know most home sewers do not have a serger, so the instructions above are for a NON-serged hem. 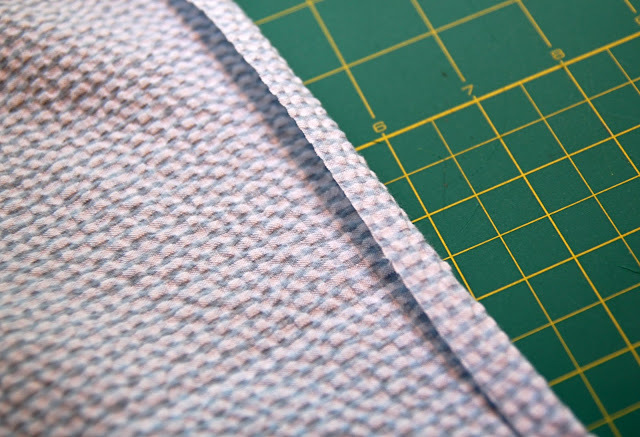 If you would like to do a serged hem, then reduce the length in the cutting instructions by 1″ for each layer. Add any trim you would like around the bottom edge of the skirt. I used some of my favorites and this bumble bee one always makes me happy. Make sure each one of your skirts is clearly labeled with the size. 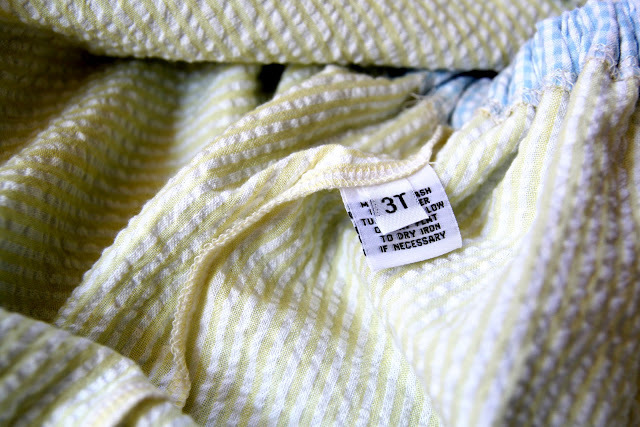 You don’t need to use woven labels like I have here, but just a note attached to the skirt will do just fine. I also hand sewed a little bow at the tops of some of the skirts for an added special touch. 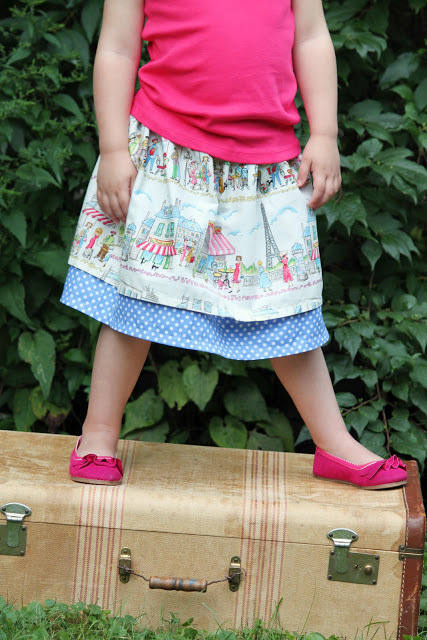 Here are some of my skirts ready to be sent off to some very special little girls. I had such a fun time sewing these this past weekend. 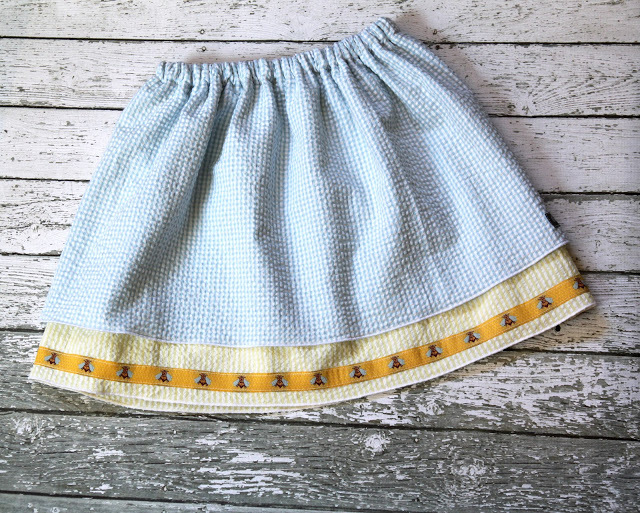 The whole time I was just imagining these little girls receiving one of these skirts and knowing that someone had care enough about them to take the time to make them something. I cannot even imagine being a foster care child, but I hope that this little gesture will at least brighten their day to know that someone out there is thinking of them, praying for them and wishing they could send each one of them a big giant hug. Sometimes it’s important to take time out of our busy lives and do something for others. This project was a true blessing for me and I thank you for causing me to take a little time to stop and smell the roses. 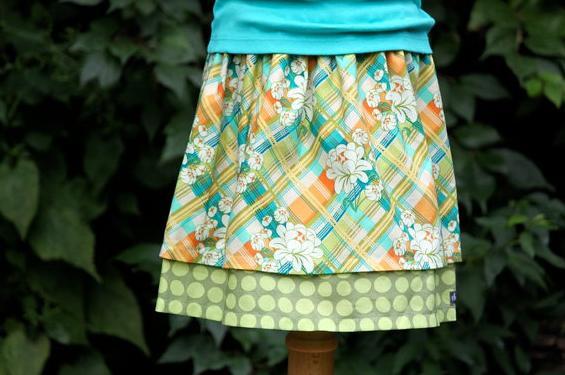 I encourage you to whip up several of these twirl skirts. I promise they don’t take much time at all and not only will it bring joy into the lives of some little girls, it will bring joy into your heart as well! This is so cute! 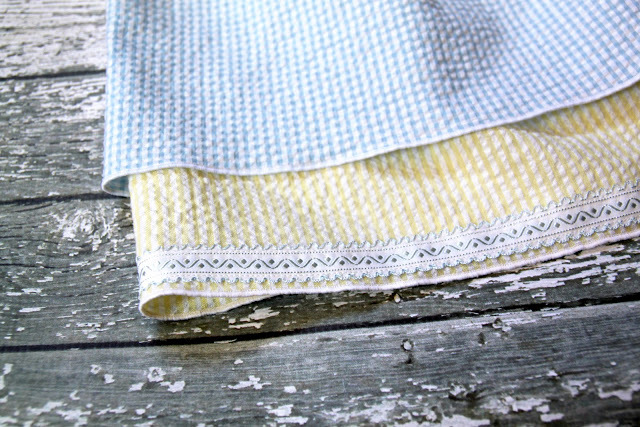 I have alot of small one yard pieces so I’m sure I can make this. It is just wonderful you included sizes up to 10. Thank you very much. I love it! This is just precious! 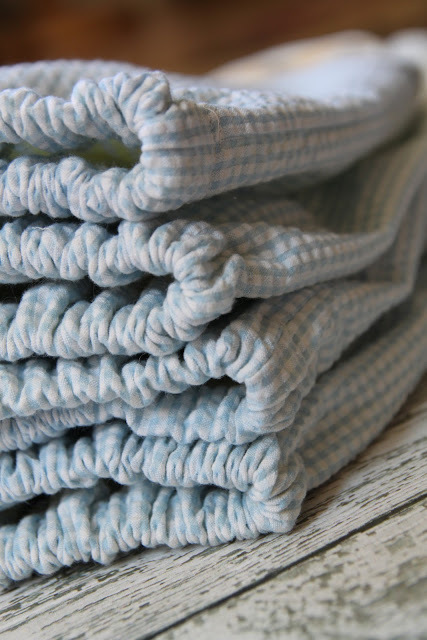 As a Great Grandma to be of a little girl in January, I will surely be making some of these-thanks so much! Thank you so much for this post. I want to let you know that I posted a link to your blog in Creative Busy Bee Craft Inspirations, under the Page 2 post on Oct. 02, 2012. Thanks again. Thanks for another great pattern…will be looking for so seersucker next trip to the fabric shop. 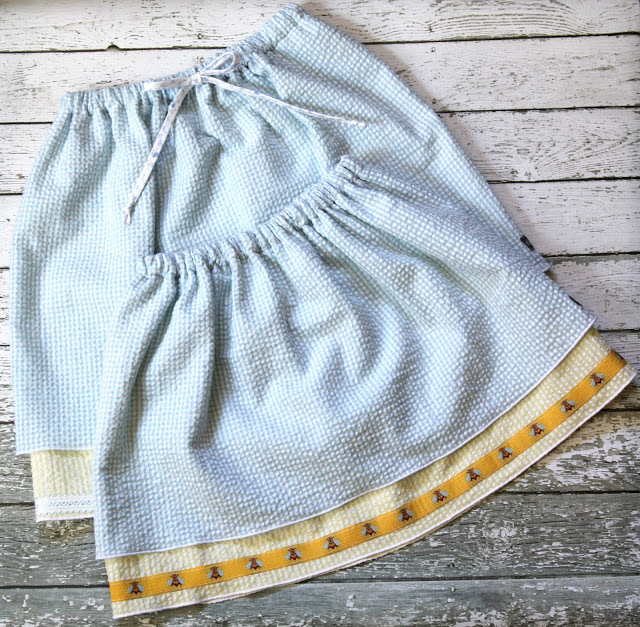 I remember my Granny making me dresses in seersucker…its a fabric I haven’t thought of for a long time. 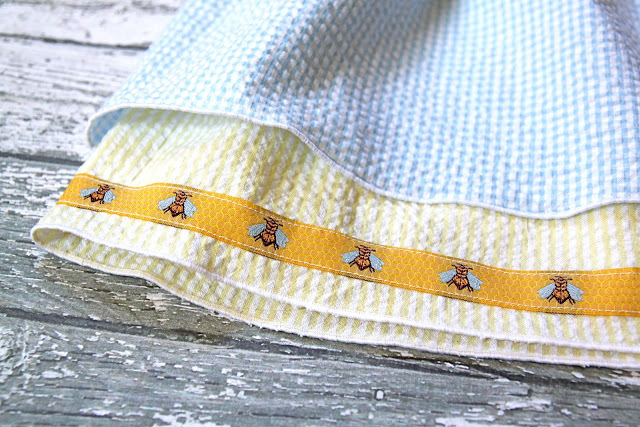 I have that bee ribbon in my stash! Got to try this. Very cute! I had bought some fabric for Valentine’s gifts for a pattern I thought I still had & guess what – can’t find it so must of gotten rid of it. This will work great! Thanks!